Free satellite parking is available at the lot on Avenida Buenos Aires across from the Feria (Boquete fairgrounds). Shuttle buses will be available beginning at 9:30 a.m. and continue throughout the day for $1/person each way. The shuttles will be passing by Bamboo Restaurant (formerly Barú) for passenger pick up and drop off, space available. PLEASE HAVE SMALL BILLS AVAILABLE FOR DRIVER. 3-5 pm running every 15 minutes. Extremely limited parking is available inside Valle Escondido. This parking will be near the entrance to Valle Escondido and will require a significant walk to the amphitheater area. Limited 3-day parking passes are available for $10 per car. VE HOA parking passes can be prepaid at the BJBF ticket office. The BJBF office is located inside of the INSIDE PANAMA Real Estate office located on the main street opposite of Big Daddy's restaurant. 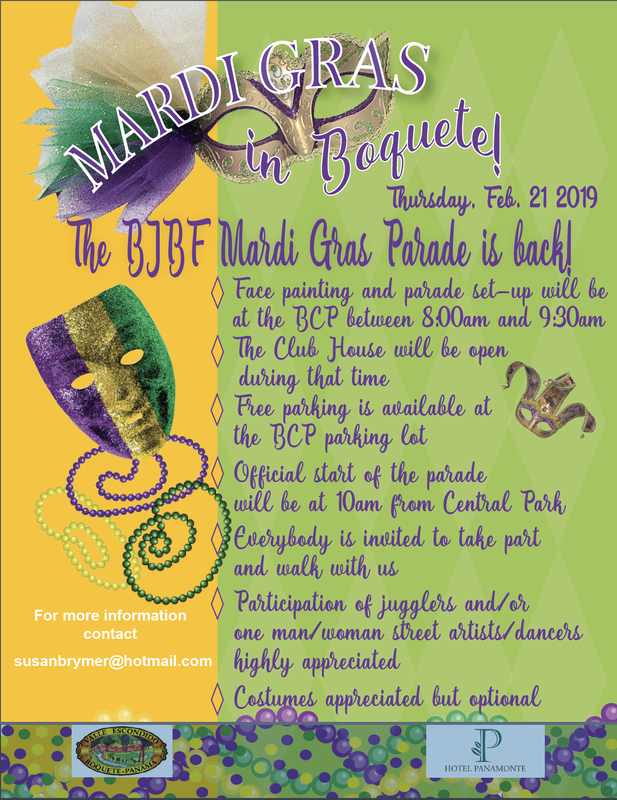 The traditional BJBF Mardi Gras parade is baaaaaack! Hear ye! Hear ye! The parade is back! Get your costumes ready and join the fun! Everybody is welcome to join the parade! Set your inner child free that's been locked up for too long and come march with us! And of you don't have a costume just come as you please! Great news about the garden party and street parade! Great news! 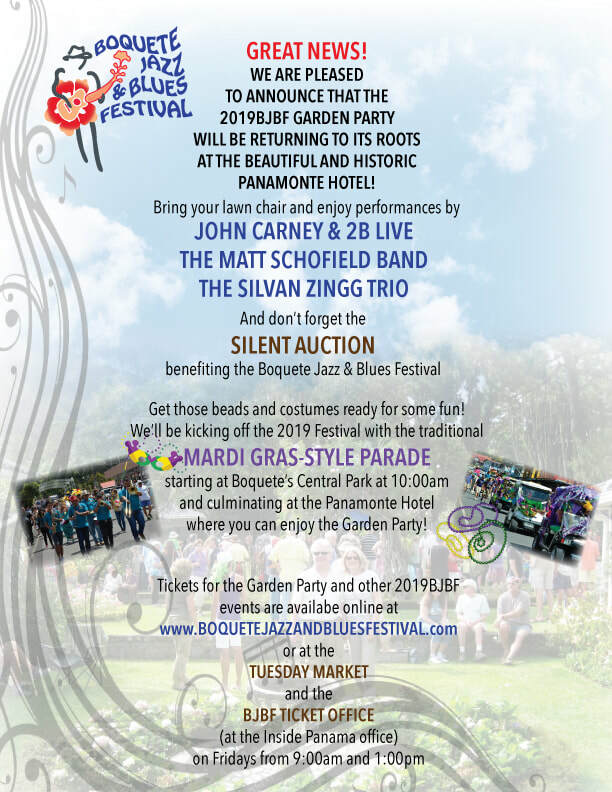 Since the BJBF garden party will return to the Panamonte Hotel which is in easy walking distance from almost anywhere in Boquete we will also have our traditional New Orleans style street parade back, so get your costumes ready with beads and all! As in the years before the parade will assemble at the BCP theater and will start from there at 10am to the Boquete central park and on to the Panamonte. More details will be published later! 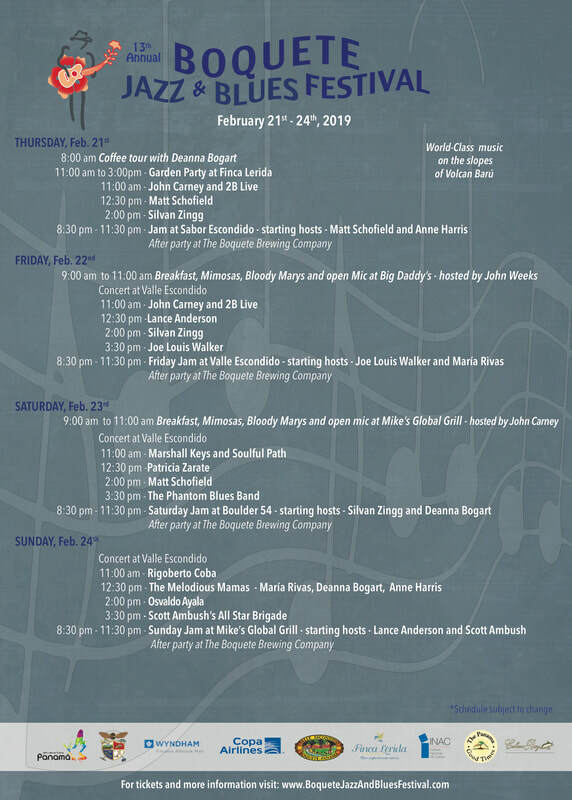 Updated BJBF2019 line-up and daily schedule published! What an incredible line-up! 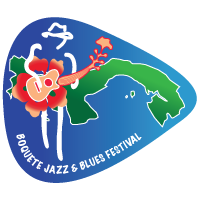 Don't miss the best of the best coming to Boquete in February next year! 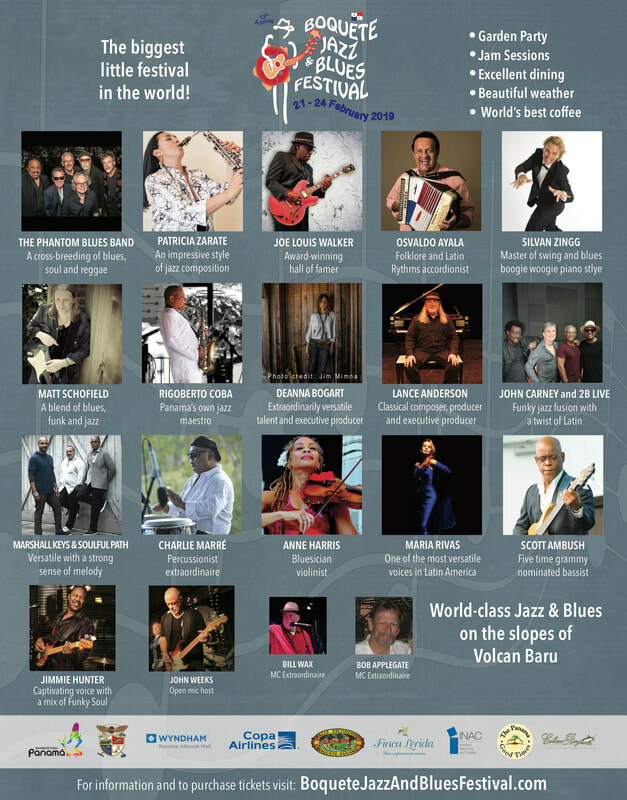 Multiple Grammy Award winners and nominees (The Phantom Blues Band, Joe Luis Walker, Scott Ambush, Maria Rivas), as well as winners of the Blues Music Awards in Memphis (Deanna Bogart, Joe Luis Walker), the Maple Blues Award and Juno Award of Canada (Lance Anderson) and an inductee of the British Blues Hall of Fame (Matt Schofield). Can't get much better that this! Partial 2019 line-up published, ticket sales start on August 15, 2018! The line-up for BJBF2019 is almost complete. Check out more details here! Tickets will be available online starting on August 15! The wait is over! Your carriage may or may not turn into a pumpkin at midnight, but you can purchase your tickets to the 2019 Boquete Jazz and Blues Festival! 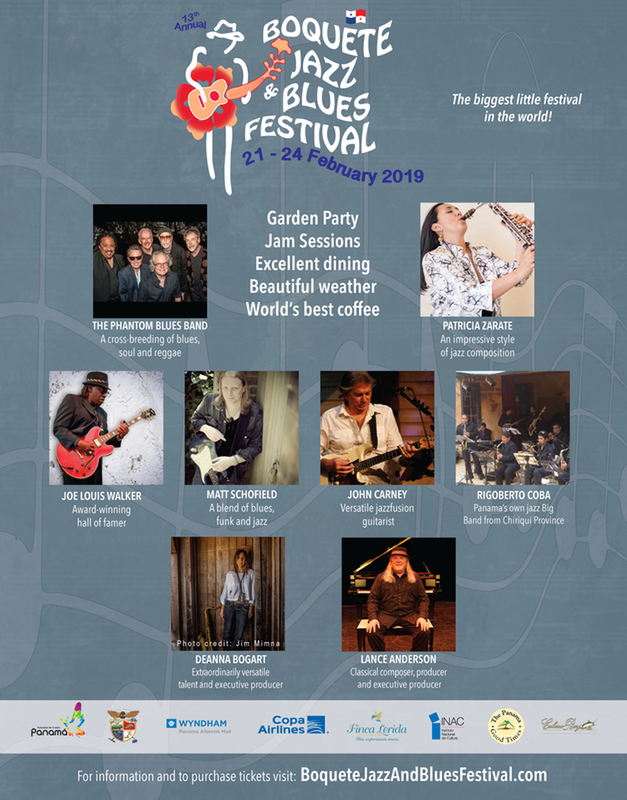 Make plans now to join us for the "biggest little festival in the world, featuring performances by The Phantom Blues Band, Joe Louis Walker, Silvan Zingg, Matt Schofield, and many more. February 21-24, 2019. Be sure to watch this page and our website for up-to-date information.